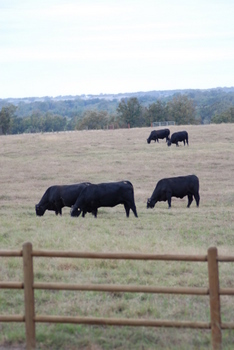 Our beef is bred and raised right here in a safe environment. These steers are hormone-free and their feed is hormone-free. This is very different than the mainstream feeder market that produces beef for today’s consumer! Because our steers are bred to bear specific beef carcass traits, specifically their rib-eye size and intra-muscular fat ratios, we can sell high quality, consistent product every time. Through the use of ultra-sound technology, we work to continually measure and identify carcass traits prior to breeding allowing us to deliver incredible tasting beef to our customers! There are many opinions of how beef should taste. We deliver beef with high-quality flavor. When the ground beef hits the pan, notice how lean it is. But when the steak hits your mouth, catch the flavor explosion! We figure that if we won’t bet on ourselves, why will anyone else??? So because we want you to be 100% confident in Third Day Beef we’ll keep some skin in the game at all times! So we guarantee that if you don’t love the taste of Third Day Beef, we will refund your money for any unused portion of beef not already thawed! That’s our 30-Day Satisfaction Guarantee! In fact, once you’ve had Third Day beef, we don’t think you’ll buy grocery store beef ever again! The incredible taste of Third Day Beef is achieved through a strategic balance of grazing time on our irrigated, quality Coastal Bermuda pastures and a specific ration of all natural grains towards the end of the finishing process. Our feeds are all natural, with no animal by-products or hormones in them. In fact, the sheer absence of hormones and chemical by-products in our beef is a big part of our flavor advantage! The other key is our dry-aging process. Dry-aging is the pocess used by the best steakhouses in the world! Every Third Day beef order is properly aged! Simply compare the Third Day Beef production process to that of the cattle being raised in today’s feed yards where you won’t find the Coastal Bermuda pastures and you will find chemicals added to their feed to force them to grow quicker as well as hormone implants and you’ll quickly understand the difference in the quality and taste of Third Day Beef! 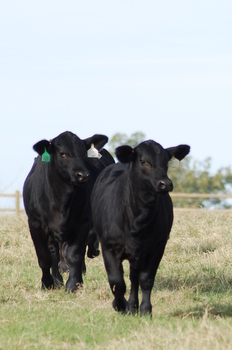 Our cattle are bred at Third Day Ranch, born at Third Day Ranch and raised at Third Day Ranch. Everything happens here under our watchful eye. You will never have to wonder where they came from (COOL – Country of Origin Labeling), because they are source verified, age verified and genetically superior in carcass traits due to the Third Day Beef breeding inputs. Quality always costs something. But quality should always bring benefits that outweigh the cost. Third Day Beef is competitively priced when purchased as a whole, half or a half of a half. The beef you buy from us has quality inputs that are not found in your local grocery store. So it’s hard to compare the cost. What you’ll find is our beef is usually cheaper than the better beef cuts in your grocery store but far exceed those cuts in quality, taste and tenderness. The process is simple. You order here on the website and make your deposit to reserve your beef. When the beef is ready (see our inventory availability link) you make your final payment and the steer is processed according to your requests and vacuum sealed and flash frozen. We will need about four weeks (due to the 21-day Dry-Aging process) to process your beef from the time it leaves the ranch. All we ask is that you pick it up from our store front within 14 days of notification. Delivery to your home is available at an additional cost.